Every Thursday, Nathan (over at Fantasy Review Barn) leads the gang in touring the mystical countryside, looking for fun and adventure. His Tough Traveling feature picks one of the most common tropes in fantasy each week, as seen in The Tough Guide to Fantasyland by Diana Wynn Jones, and invites us to join in the adventure. All are invited to take part, so if you're joining the journey late, no worries . . . we'll save you a spot in the caravan. Well, if this week's topic doesn't fill me with guilt for all the absolutely stellar series I've begun over the years, but have yet to finish! 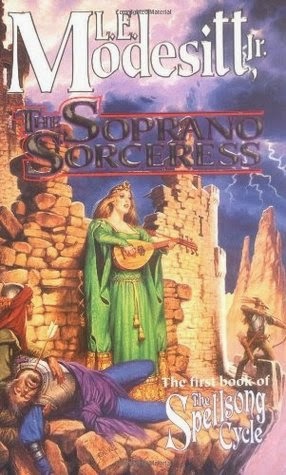 Sure, I could talk about Tom Bombadil from Lord of the Rings, Thom Merrlin and the gleemen of Wheel of Time, or the Free Bards of Mercedes Lackey, but let us sing of tales where music has power, and where the bards are heroes . . . The Spellsong Cycle is actually the second series from L.E. Modesitt, Jr. that I've begun, thoroughly enjoyed, and yet somehow failed to follow through to the end. It's a series that begins with a traditional bit of portal fantasy, taking a small-time opera singer from our world, and establishing her as a powerful sorceress in the world of Erde. Here, music is magic, but it's only ever been something sung, and even relatively minor accomplishments are exhausting. Anna brings in instruments to accompany her voice, along with other spellsingers to sing with her in harmony, allowing her to create truly awesome (and terrifying) feats of magic, from the building of bridges to the annihilation of an entire battlefield. Initially, it bothered me that Anna learns so quickly, and that her magic escalates exponentially, but once Modesitt starts exploring the consequences of unbridled, unchecked power, that's where the series really gets interesting. 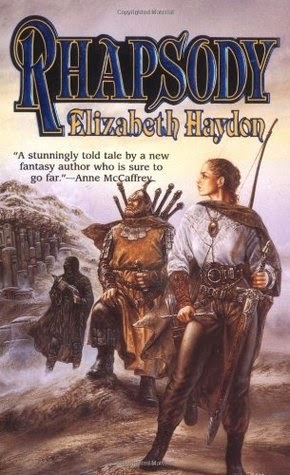 The Symphony of Ages series from Elizabeth Haydon, meanwhile, is pure epic fantasy - no portals involved. Rhapsody is a singer, descended from a half-elven lineage, who can channel music through her voice. She is also a Namer, with magic powerful enough to literally rename people, forcing them to adopt a new persona. There's a bit of romance mixed in with the adventure and the drama, and her magic lacks the flashy 'awe' of Anna's, but it's immensely powerful in its own right, reshaping reality, with all the consequences and threads you can imagine. The quest/journey element of the first book does get a bit tiresome (they spend forever travelling through a magic underground tunnel), but it's necessary to bring the characters together, refine their magical essences, and establish them for the series to come. 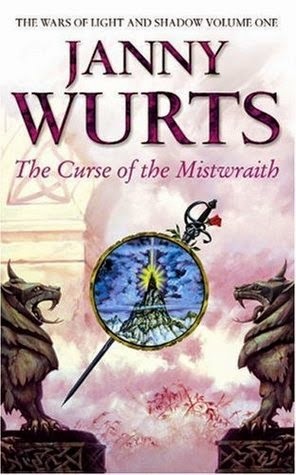 In the Wars of Light and Shadow series by Janny Wurts bards are able to harness, shape, and cast incredible magical forces through both voice and instruments, with the complexity of the music contributing to the overall effect. Arithon s'Ffalenn is the primary bard here, one of two protagonists, trained in magecraft to be the Masterbard of Athera. His 'weapon' of choice is a lyranthe, a stringed instrument that is capable of producing the complex tonal harmonics needed to harness the magic of his trained voice. It is said that "a bard with a lyranthe can make a symphony unto himself," which elevates the magic here to a level even more impressive than that of Modesitt's world. Arithon, as Masterbard, is able to perform intimate magics, manipulating human emotions, and even stylistic spells, destroying entire cities and changing the course of the seasons. 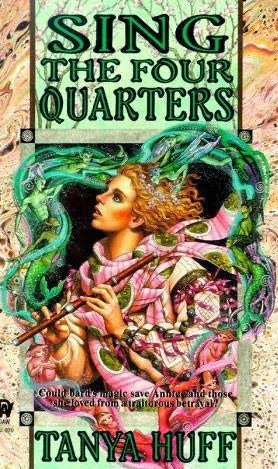 Finally, we have the bards of The Quarters Novels by Tanya Huff, who may not be as powerful as some of those we've already discussed, but whose social structure is probably the most fascinating and well-developed. These books are set in a world where bards are as much messengers as magicians, travelling throughout the kingdom as emissaries of the King. These bards forsake all other allegiances, loyalties, and family ties to study at the Bardic Hall, where they learn to sing the 'kigh' (elemental spirits) into doing their bidding. Princess Annice is the heroine of the first book, renouncing her royal blood and privileges to learn magic, but she's as much a fugitive as a heroine (aided and abetted by her lesbian partner), owing to a forbidden pregnancy and her rescue of the unborn child's father. I'll have to pick up The Symphony of Ages. I like your topic - music has power even in our world so it's a cool thing that authors choose to incorporate this into their fantasy. I appreciate stories where magic has a cost and consequences! Every single one of them new to me as well. Well, unread by me, not actually new, as I know the authors. The less said about Tom Bombadil, the better . . .
Well, I don't know how you manage it but every week you come up with a list of books from which I've read absolutely none. I feel ashamed! Such gaping holes in my fantasy reading.